Don’t want to miss a moment of the 20th anniversary experience! Join the Tour of Kitchens Host Committee by purchasing your Host Package today. Your package includes (2) tickets to both Tour of Kitchens and Toast of the Tour as well as (2) tickets to the exclusive Host Breakfast to be held at Sub-Zero Wolf on Saturday, March 25. 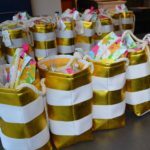 Your own Host Gift Bag, filled with goodies from premier Atlanta brands, will be waiting for you at the Host Breakfast. Quantities are limited and subject to availability; purchase yours today by clicking the below link. For the most exclusive Tour experience, consider purchasing the VIP Host Package. By joining the VIP Host Committee, you’ll receive not only (2) tickets to Toast of the Tour, (4) tickets to Tour of Kitchens, (2) tickets to the Host Breakfast but also (2) invitations to the private VIP Dinner on Saturday, March 25. The VIP Dinner, hosted by Design Galleria, Rothman + Rothman and Insidesign, will be held in three of the Tour homes and features a four-course dinner experience complete wine pairings and gorgeous tablescapes by Christopher Confero. Sun in My Belly and Sizzling Peach will leave your mouthwatering with their personalized menus for the evening.